A “turkey neck” refers to the loose, sagging neck skin that can develop as we age. The sagging skin can be caused by the neck muscles weakening and no longer supporting the skin, or simply just from the skin losing elasticity over time. For those committed to retaining their youthful appearance and fighting the tell-tale signs of aging, it is easy to get focused on taking care of the face and neglect the neck. No matter how attentive you are to preventing and reversing the signs of age on your face, a turkey neck can quickly give you away. Whether you are in the prevention stage or your “wattle” is in full swing, we have six treatment options to help you get rid of your turkey neck. Nuvesse MD Serum No. 31 Neck Firming Mask is an at-home treatment that uses Cellulation™ Technology to improve the appearance of neck skin. This technology allows the ingredients in the serum to travel through the tough outer layer of the skin and deliver more nourishing ingredients to the layer where collagen and elastin form. The masks are clinically proven to accelerate cellular regeneration while they firm, tone, and restore the skin, helping to minimize the appearance of fine lines and wrinkles with results visible immediately. Nectifirm from Revision Skincare is an excellent way to boost your at-home skin care regimen. Adding a neck cream is important because they are designed specifically for the thin skin on your neck. This super cream contains plant extracts, antioxidants and unique biotechnological blends that work together to improve the appearance of fine lines and wrinkles, reduce the appearance of rough crepey skin, and help the skin appear firmer and lifted, creating a smoother, younger-looking neck. 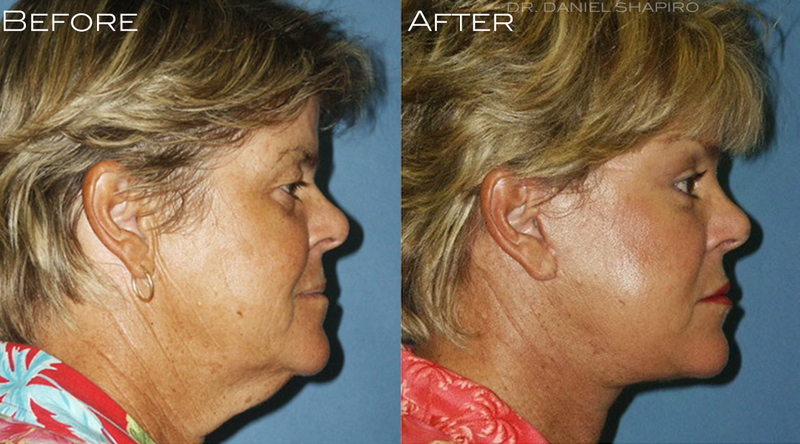 Ultherapy is an ideal solution for individuals that have mild to moderate sagging in the face and neck but aren’t ready to undergo a surgical procedure such as a facelift. It is a non-invasive procedure that uses ultrasound energy to stimulate collagen production, lifting and tightening the skin on the neck and under the chin, as well as improving the appearance of lines and wrinkles on the décolletage. Some patients see tightening of the skin immediately after treatment, but maximum results appear over two to three months as new collagen growth occurs and works to lift and tighten the skin. Kybella is a cutting-edge treatment that takes only minutes in the office, and the final results are dramatic. This FDA-approved injectable treatment offers patients a noninvasive option to improve the appearance of their double chin, producing unparalleled results in areas showing moderate to severe submental fullness. The key to Kybella’s effectiveness is deoxycholic acid, a naturally occurring molecule in the body that aids in the breakdown and absorption of dietary fat. Injecting it into the submental fat under the chin allows the body to slowly dissolve and metabolize the fat cells, simultaneously sculpting below the chin, to give your jawline a smoother, tighter appearance. A neck lift is appropriate for someone who has significant sagging of the neck skin and whose neck appears much older than their face. A neck lift is a surgical procedure that tightens the neck muscles and neck skin to restore a youthful appearance to the jawline, chin, and neck. Strategically concealing incisions along the back hairline and behind the ears ensures that the result is a natural looking, beautiful neckline without a trace of that turkey neck. A facelift is a “full-service” surgical procedure and is the best option for someone wanting to address facial and neck aging simultaneously. A well-executed facelift does not make a “new” you; it restores the naturally vibrant “you” from 10 or 15 years ago by taking years off of your appearance, improving many areas of the face and re-contouring your neck and jawline. From at-home firming masks to non-invasive in-office procedures, all the way to a full facelift, we have what you need to get rid of your turkey neck and get your neck looking great. Call (480) 451-1700 today to get more information on our treatment options or schedule a consultation to get a customized treatment plan that is perfect for you!